Plays counterclockwise around perimeter of 30 acre park. Some holes meander through woods next to the scenic East Fork of the Little Miami River. 6 holes across stream on wooded hillside. Water in play on #5, 7, 8 & 16. 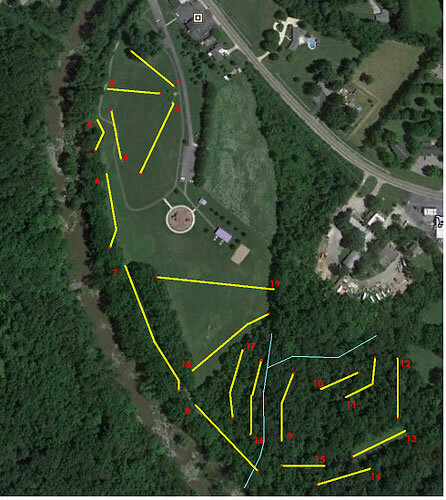 Multiple pin and tee locations. Player contact; Chris Clark 513-460-7866 or 513-724-0656. 28 miles east of Cincinnati. I-275 to OH-32 E exit (exit 63B), 13.5 miles east (towards Batavia) to a right on De La Palma (light), 1.2 miles to Main St. 1st tee 10 yards to right of flagpole. Practice basket by Park Info Board. A mix of open and wooded (with fair woods holes). Sometimes confusing navigation - bring map - and the rough can be HIGH. The course gets more interesting after #5. A great mixture of open, woods and elevation.